In the last blog post I spoke of how red dresses have become my thing every Vday, that I now consider them a tradition, well today as I sat down to write this I realized these Neiman Marcus Trend Report posts have also become a tradition, as you can see last year's here, and the one before that here. For those of you who are new to my blog (hi, and thank you for joining me!) 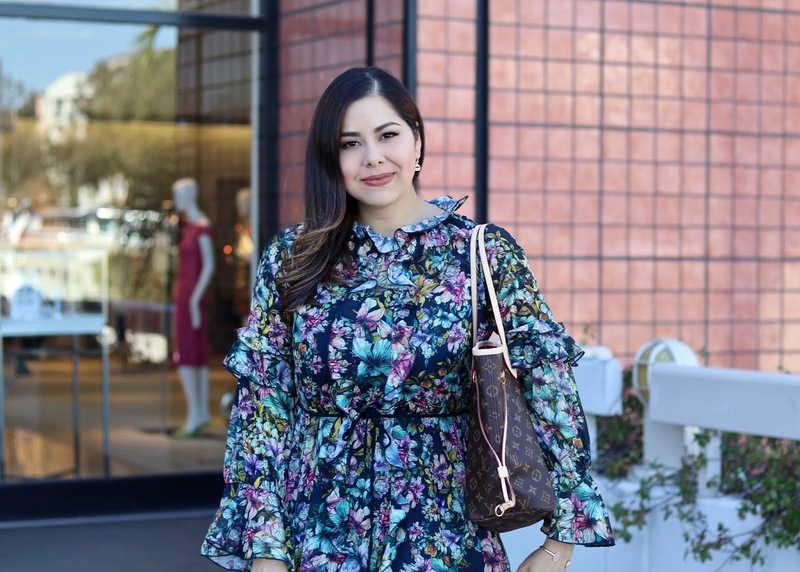 and are not familiar with what I am talking about, Neiman Marcus here in Fashion Valley San Diego hosts a Trend Report Luncheon for local bloggers, stylists and influencers twice a year. It has become one of my favorite fashionable events to attend because I can always count on them to give me the rundown on the latest trends via a mini fashion show with a side of delicious food! Plus, it's also great to catch up with my fellow blogger friends! The crazy thing is the last trend report I attended I had Oscar Julian growing in my belly! This year, I have a 2.5 month old and had to make arrangements to have him watched so this mommy could have some ME time! For the event, I wore this dress that actually is pretty affordable and comes in another color! I did want to note that I added a little belt to cinch in the waist just in case you go buy it and wonder why mine looks a bit different 😉. 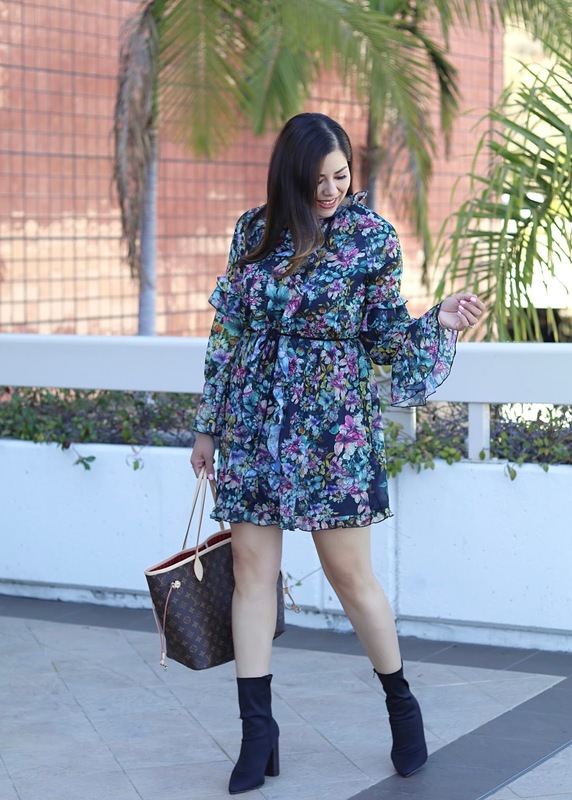 It's what I call dipping my toe in Spring because of the florals, the flowyness, the ruffles and sleeves but still paired with a Winter trend- these pointed boots. 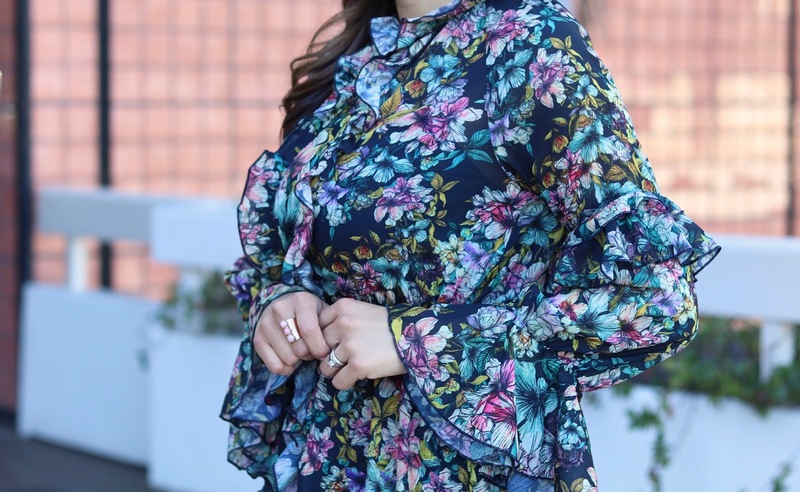 Hope you like the outfit, and stay tuned as I bring you a full blog post dedicated to the Spring 2018 Trends as shown by Neiman Marcus Fashion Valley in the upcoming blog post! If you want to take a peek, I saved the instastories on the event on my Instagram Highlight Stories under the "Lifestyle" highlight videos! 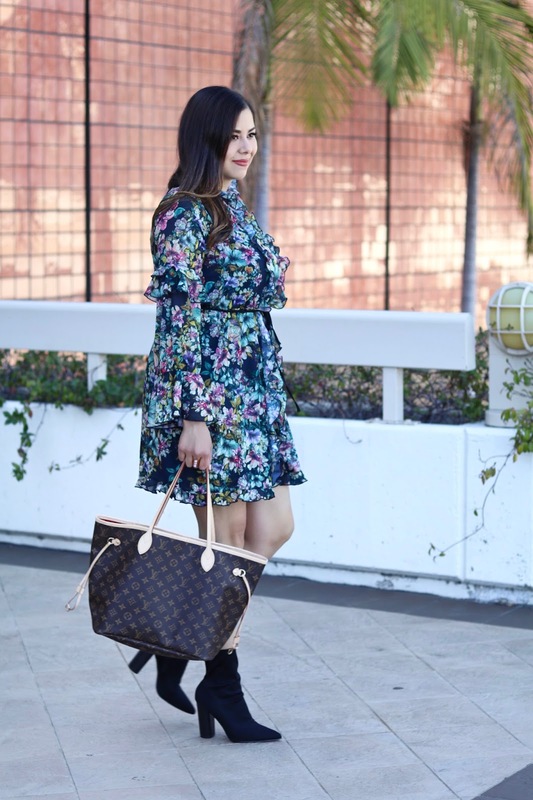 Thank you to my friend & fellow style blogger WhiteTeeBlackDress for taking these pics!